Walsine Pierce: LONG BLOGS: A Big Windbag! My blogs are soo looong! Let's face it, I'm windy! 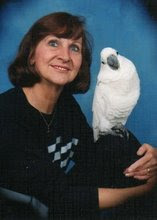 I've made a new blog friend, Myrna Rae, in Venice Florida. Her blog site is "Life with Myrna Rae". She has a facinating profile and has a good testimony for Christ. She writes a beautiful blog that conveys wonderful thoughts. She is responsive to the message of others. I suggested that she check out my son's blog, Church Requel, and she has added it to her blog site. She follows a lot of blogs. Her blogs are so short!